NZOQ training is available at locations across New Zealand. Internal Auditor training can be offered as three-day in-house training which combines the two-day learning with a practical audit. In each case, the training is customised to meet the organisation's requirements. Contact Tess Stewart at NZOQ National Office (+64 6 351 4407) for more information about Corporate training. Small businesses may qualify for vouchers to help pay for services such as training workshops and courses that build the management capabilities of their owners, operators and key managers. It doesn't matter how successful you are—there's always room for improvement. NZOQ has the support and resources you need to take your business to the next level. We can help identify areas for improvement so you can achieve world-class levels of performance, enhanced employee and customer relations, increased productivity, and greater profitability. Internal audits are a powerful management tool for improving the performance of an organisation's quality systems. NZOQ's Internal Auditor training offers a comprehensive two-day programme that provides participants with the knowledge and skills they need to conduct internal management systems audits in and for their own organisations. Internal audits offer an invaluable opportunity for businesses to improve their performance and to streamline internal processes and systems. It gives management an independent assessment of the 'health' of their business, and identifies any gaps between what was planned for and what is really happening. Role plays and case studies based on actual audits will be used to reinforce the concepts and provide participants with practice in applying the principles to situations typically encountered during internal auditing. Auditing is a highly effective and necessary management tool. Every business should use it in the pursuit of continuous improvement. There is no prerequisite for attendance. However, the course is intended for persons who are familiar with the basic concepts of quality management systems and who have had some involvement with their own organisation's quality management system. The programme is well respected internationally and has been constantly updated since it was first designed in 1985 and accredited in 1989. Michael Voss has been involved in the quality field in the electronics and IT industry for over 20 years, including five years as Quality Manager for an internationally recognised ISO 9001 certified supplier of innovative products to the oil industry retail and security industries, and today operates his own business improvement consultancy. Michael's formal education is in science and electrical engineering where he holds B.Sc (Physics) and BE (Hons) degrees from Canterbury University. He is currently a registered Quality Manager, member of Institution of Professional Engineers of New Zealand, member of Institute of Electrical & Electronics Engineers, Associate Fellow of New Zealand Institute of Management, and past Development Director serving on the Board of the New Zealand Organisation for Quality. Michael brings a broad base of experience working with organisations from two person partnerships to multi-site companies employing 300 or more employees, and a wide range of businesses including government departments/local bodies, manufacturers, high technology companies, tourist operators, exporters, retailers and service based organisations. He is particularly skilled in the integration of business excellence principles with ISO 9001 and ISO 14001 compliant Management Systems. In addition to this work in Quality Management and organisational improvement, Michael is also involved in new technology, engineering management, product management and project management. What's included in the training fee? Tuition, a full set of course notes, and catering (morning tea, lunch, and afternoon tea) are all included in the training fee. A cancellation fee of 20% applies for all cancellations made at least two weeks prior to the training date and 60% for cancellations after this. Contact Tess Stewart at NZOQ National Office (+64 6 351 4407) to chat about which training options are right for you. Enter your name and email address above to have Q-zine delivered right to your inbox! NZOQ offers practical and proven training options to meet market challenges, to reduce costs, and to improve productivity—at locations across New Zealand. Apply for NZOQ membership to access our wealth of knowledge. Register online for one of our highly-regarded training courses. Members can access iQ to download Quality Business and other resources. 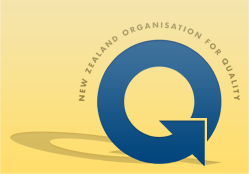 NZOQ is the New Zealand association for quality improvement and practice.